Mumbai’s first childrens museum opens to public at Chatrapati Shivaji Maharaj Vastu Sangrahalaya. Express photo by Nirmal Harindran, 29th March 2019, Mumbai. The museum displays a wide range of art, from ancient sculptures to contemporary paintings, depicting India’s rich culture and heritage, re-interpreted through a child’s imagination. The 50 artefacts include a sculpture of freedom fighter Bal Gangadhar Tilak and Mahatma Gandhi’s Charkha. The themes will be changed every few months. The current exhibition is classified into six themes — teamwork, courage, peace, environmental consciousness, friendship and hard work. “We feel these are the six values that are required to make this world a better place,” says Ravi. The 1,200 square feet museum has a reading corner, multipurpose hall, amphitheater and terrace deck. 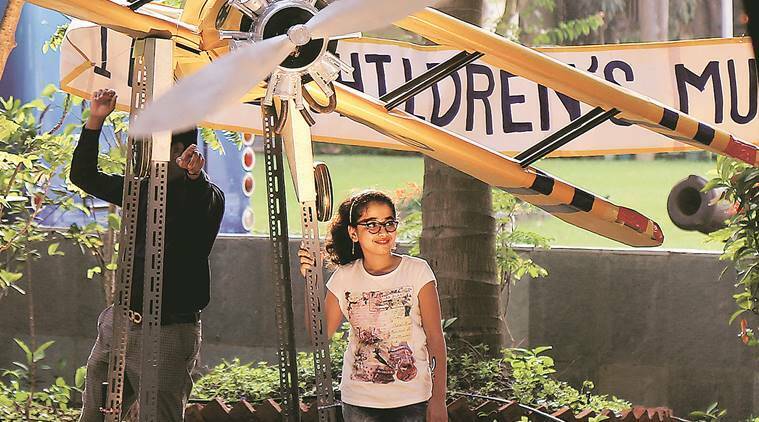 “The project has taught me a lot of things such as teamwork, patience and brainstorming, which do not come from a textbook,” says 13-year-old Smit Kothari, a student of Udayachal High School.